There are many very good reasons to invest in Douglas…Here are just 10. Average transaction values in Douglas are approximately 33% higher than those in the UK. We have recently been investigating transaction values in Douglas. 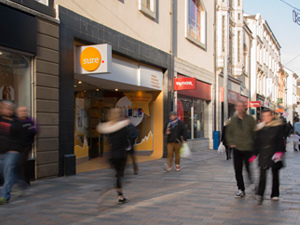 Research with multiple retailers indicates that transaction values in their Douglas stores tend to be about a third higher than in the group as a whole. Vacancy rates in Douglas have remained significantly lower than the Northwest of England. Rates have also generally remained below the UK average since we started recording them in June 2012. Property rates are considerably lower in the Isle of Man than the UK. 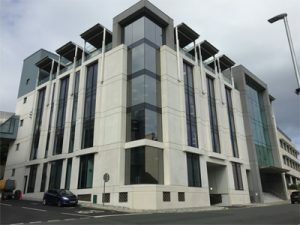 The Isle of Man has a different rating system to the UK and rates for businesses premises are likely to be considerably lower than UK equivalents. The Isle of Man has a 0% Corporate Tax rate for all resident and non-resident companies with the exception of banks (10%), income from land and property (20%) and retail businesses with profits on the island over £500,000 (10%). More details. More useful information on corporate inward investment can be found here. Douglas town centre is undergoing a major regeneration programme. 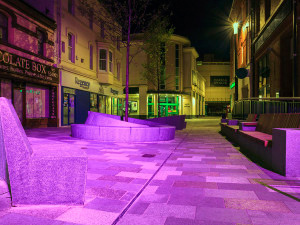 The project, which has been funded through the Town & Village Centre Regeneration Scheme and Douglas Borough Council, is nearing completion with new granite paving, high quality street furniture and street and feature lighting and facilities such as power supplies to support events . The high quality scheme won the Landscape Category at the Stone Awards 2014. 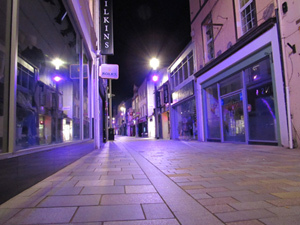 Grants are also available for property owners and occupiers to make improvements to enhance the appearance of town centre premises. Details of the Regeneration Scheme including grants can be found here. New retail development should take place in the island’s existing town centres. The Isle of Man Strategic Plan, the island’s planning policy document, is clear that out of town retailing will only be permitted under very strict and prescribed circumstances. This has helped to make sure that Douglas town centre remains a lively, vibrant retail location at the heart of the island’s capital. The Isle of Man Strategic Plan can be downloaded here. 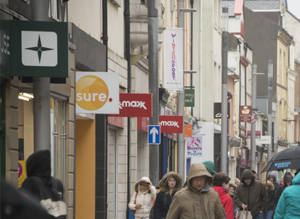 The Isle of Man Retail Sector Strategy can be downloaded here. 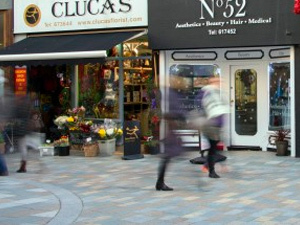 Douglas has a dedicated Town Centre Manager whose role it is to ensure the town centre remains a lively vibrant place. The town has full programme of events such as food and craft fairs, entertainment and seasonal activities. 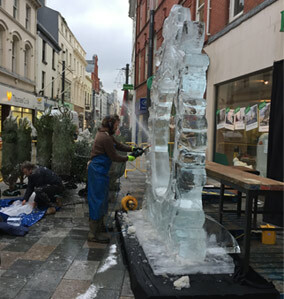 The large ice sculpture in the picture formed part of our Christmas events schedule. Promotional events such as the annual Tower of Refuge Walk, and Douglas Carnival attract thousands of people, many of whom take advantage of the numerous offers in restaurants and eateries. To keep up to date with what’s happening in the town centre, please follow our Facebook page. The Isle of Man has an outstanding public transport system, all of which converges on Douglas town centre. 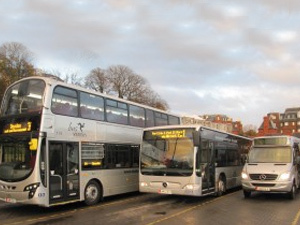 A fleet of high quality, modern buses operates from the main terminus at Lord Street linking Douglas to all of the towns and villages of the island. The island’s main port and Sea Terminal is located adjacent to the main town centre with very quick and easy access for freight, tourists and cruise passengers. In addition, the island has an extensive network of vintage transport; the steam railway station is situated a short walk along the picturesque harbour to the south west of the town centre and the historic horse tramway runs along the Promenade to link up with the Manx Electric Railway to Laxey, Ramsey and Snaefell. Douglas town centre is also very well provided with taxi ranks at key locations. Douglas is well provided with a range of private, commuter, public and shopper car parking including some free on-street disc parking. 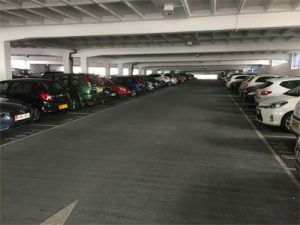 This enables shoppers to easily find the type of parking most suitable for their needs. There is free car parking on Loch Promenade, which runs closely parallel to the main Strand Street retail area. The main carparks are, Chester Street, Drumgold Street, Shaws Brow, the Bottle Neck and Lord Street. Chester Street, the Bottle Neck and Shaws Brow are free on Sundays and Bank Holidays. On a Saturday you can park for the full day in Chester Street for £2. Douglas Town Centre has a very healthy mix of businesses types. Over 70% of retail businesses are currently independents, more than twice the average rate in the UK. Consequently there is plenty of opportunity for new multiple retailers to open branches in Douglas without it becoming a “clone town”. Having said that, the town already hosts many well-known high street names. The Isle of Man has one of the lowest crime rates in the British Isles. In support of this, we operate a “ShopWatch” scheme in order to assist retail businesses in minimising any losses through retail crime. More details. 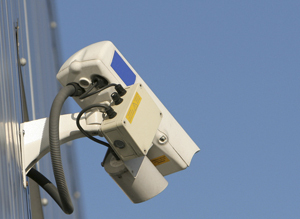 The Town Centre is also covered by a modern and comprehensive CCTV system operated by Douglas Borough Council.